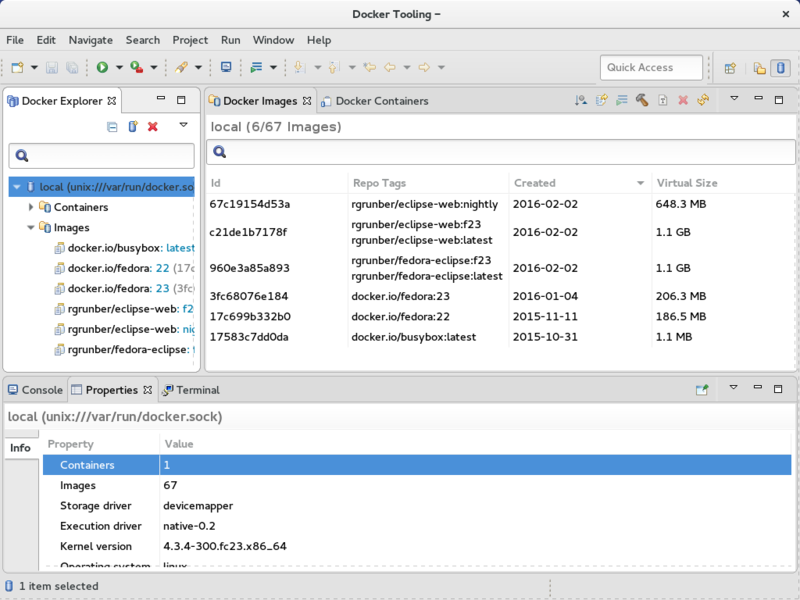 The Eclipse Docker Tooling plugin provides the ability to manage Docker images and containers from within the Eclipse IDE. 22 Cannot continue the operation. There is another install operation in progress. By adding the following code below to your website you will be able to add an install button for Eclipse Docker Tooling. on plugin version 4.0.0.201806122135 on a Eclipse 2018-12 version under Linux/GTK, I have issues adding/editing Exposed Ports for container. In case of Edit: when I run the Container I don't see any exposed ports. In case of Add (e.g. 1234 -> 12345): I see that the new port has Type tcp and not /tcp (it's missing the backslash) and when I try to run the container I get an error message saying invalid port specitication: \"1234tcp\". Seems like the port exposing syntax is not correct or something like that. It would be good if the two default connections would delete when you remove them - no matter how many times I try and remove it - they back there again the next time I start eclipse. I also have the same issue about the multiple tabs and it is soooo irritating! Eclipse IDE for Enterprise Java Developers. I use multiple instances of Eclipse with different perspectives open at the same time. I am using the Docker perspective in a separate instance to manage my containers. However when I open a different Eclipse instance with a different workspace, one that doe not have the docker perspective open, I still get multiple tabs being opened for Docker Images and Docker Containers. These will often not let you close at least the images tab, or more accurately it just reopens the tab immediately. in the new instance this creates errors since I don't have any connection defined. Same on 4.8.0, drives me nuts! I uninstalled the docker tooling and it started coming up with errors for the missing editors and so then I re-installed the docker tooling and the editors are no longer erroring but are persistent. I installed Docker Tooling from marketplace. It shows up as installed "Eclipse Docker Tooling 4.0.0.201806122135". However, when perspective is selected, does not show in in the list of perspectives. If this is installed in Oxygen, no issues (different version number). I got this error message when trying to install this plugin in Neon 3 on Mac. Any idea? Yes, it still points to the wrong upgrade site. Somebody tell us When will this be corrected? Hmm, I had archived some directories and realized I over did it. I had put it back in our downloads folder, but because I didn't delete it from the archives folder, it still thinks it is archived. Try it now. A problem was found where Docker Tooling was bringing in dependencies that causes issues with other plug-ins. If you installed 2.3.1, try uninstalling and replacing with the 2.3.0.201704251823 version which has back-levelled some dependencies. This problem will not occur with Eclipse Oxygen and later.